In the Perth area ants are completely at home thanks to a wet climate that creates plentiful amounts of dead, wet wood… the kind of material in which ants like to make their homes. Tree stumps and old, rotting logs are perfect spots for nests, and so are building structures where moisture has been allowed to begin the process of decay that ants find so appealing. 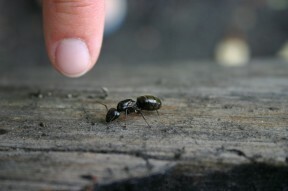 Damp wood in a home as a result of leaks from poor construction, damage to the structure, or poor maintenance is the perfect habitat for ants, which are constantly on the lookout for places to raise their young. To get to either, they burrow their way through the damaged wood, and eventually chew through newer, drier wood to get from place to place. In the process, they weaken the wood structure, which could eventually cause it to require significant repairs that will be expensive. In the absolute worst-case scenarios, the building could eventually collapse from the damage, although the likelihood is extremely minimal. Wood decay may be caused by exposure to leaks, condensation or poor air circulation. Nests in homes are usually found behind bathroom tiles or around sinks, tubs and showers. Floors under leaking dishwashers create ideal conditions, as do leaks under roofing and in attic beams, or under sub-floor insulation. Hollow spaces such as doors and wall voids are good, and even foam insulation is often used. Ants will establish satellite nests and not all nests require damp wood. 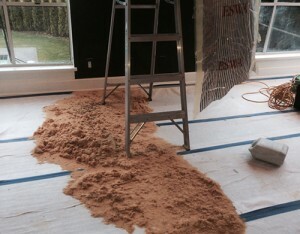 Foam insulation is easy for a ant to chew through and construct it’s maze of tunnels. The best way to avoid damage caused by ants is to keep your home in good repair, and to prevent opportunities for moisture to rot the wood around the building. This is always a challenge in Metro Perth, but the good news is ants will not start an assault on your home by attacking dry wood although they will set up satellite nests in dry wood or Styrofoam insulation. The best defence is ensuring that any opportunities for moisture to do damage are minimized. Make sure your gutters are cleaned regularly to prevent overflow. 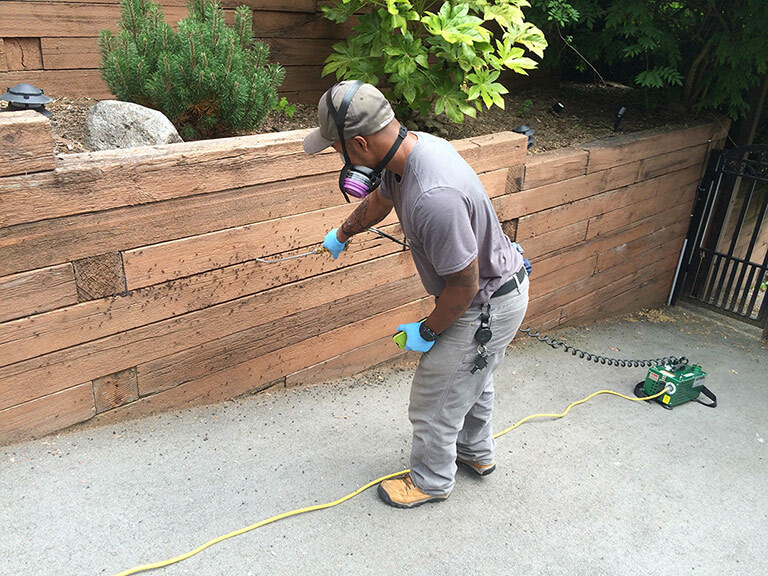 Ensure the wood siding of your home is not touching the moist earth around it. Don’t pile firewood near the house or let branches from trees touch the building. Remove all stumps and logs from nearby, and check for rotting landscape ties. Ventilate cool, damp areas of your home so moisture doesn’t have a chance to rot the wood from the interior. Make sure you repair all plumbing leaks as soon as they’re spotted. 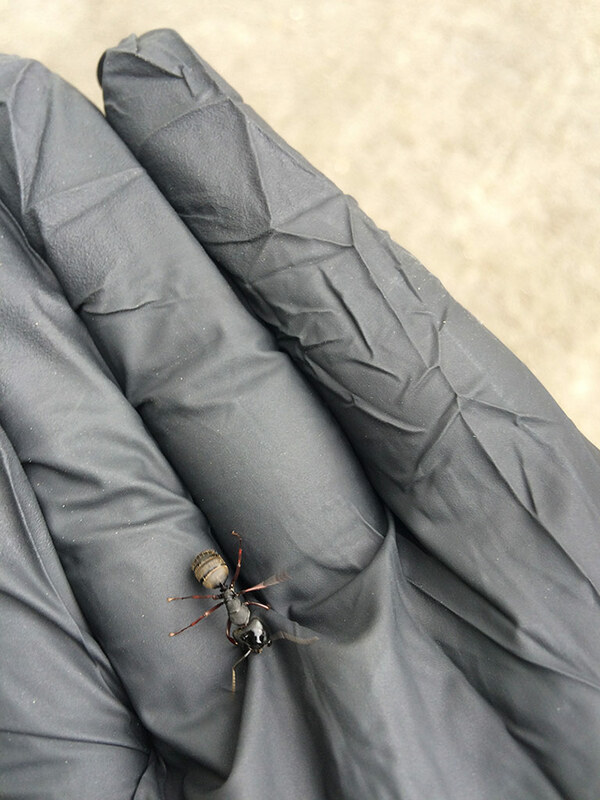 Another way to prevent ants from coming near your home is to give them no excuse to do so. Ants love sweet stuff, and have a real knack for finding it. Clematis vines are really nice when they flower in the summer time but they provide a favourite tasty treat for ants, high in carbohydrates. We do not suggest you dig up the whole garden, plants and insects are very important! However, to keep insects such as ants at a distance from your home, you should also keep the food sources a short distance from the home – even if it just means the vegetation is not in direct contact with the foundation or siding. The worker ants are tireless, and are constantly working on building nests or foraging for food. They’re the ones you see traipsing across your floorboards or driveway, and they’re the ones that will chew their way through your house’s wood structure. It’s interesting to note that unlike termites, ants don’t actually eat the wood as they’re not able to digest cellulose; instead they prefer dead insects, honeydew from aphids, plant secretions, and even rotting fruit. Ants in the Western Australia are generally most active during the summer and the ant trails (the routes used to travel to food sources) are used most often after sunset and through the night, although ants can be seen on the trails at all hours of the day. The tunnels created by ants often can’t be seen because the activity takes place inside of the wood, but if you suspect there are ants in a particular piece of wood, tap it and then listen for the tell-tale rustling sounds you can often hear if you listen hard enough – kind of a “snap crackle pop” (Rice Crispies) Oh, and if you see large, winged ants crawling out of the wood on your home, it’s as sure a sign as you can get that the ants have set up a nest. 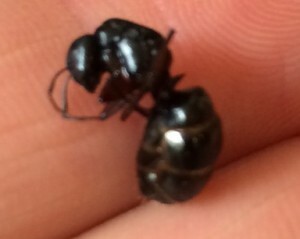 Another important tell to determine whether you have ants or termites is to have a look at the tunnels in the wood. If there’s mud or dirt in the tunnels, it means you have termites, because ants like tidy passageways. Need help with Ant Control in WA? Call the Perth Pest Control experts now at 0416334479 or contact Frank Gilmour Pest Control Perth by submitting an enquiry. From insect control to Perth rat control, Frank Gilmour Pest Control Perth does it all.